3. Wanderers know that a path doesn’t have to lead to anywhere in particular. This free-form gravel path, barely 25 feet long, has a Japanese maple at its end and could easily fit into an average suburban yard. For those who walk there in the late afternoon, this path partners with the setting sun to offer a 15-minute light show that is nothing short of spectacular. And for the wanderer, that is more than enough. Wanderers know that a path doesn’t have to lead to anywhere in particular. 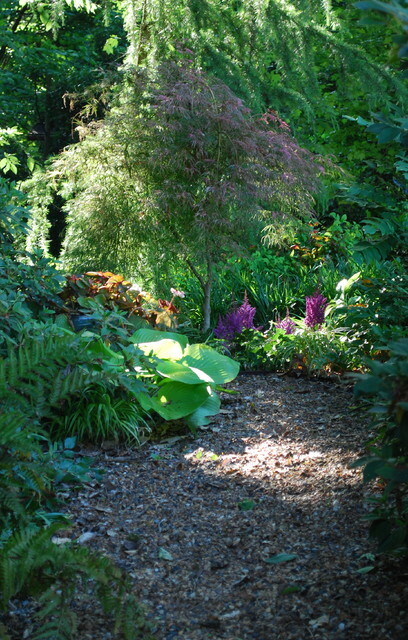 This free-form gravel path, barely 25 feet long, has a Japanese maple at its end and could easily fit into an average suburban yard. For those who walk there in the late afternoon, this path partners with the setting sun to offer a 15-minute light show that is nothing short of spectacular. And for the wanderer, that is more than enough. Specimen planting for an offshoot of the path.